As a quick reminder, the Warrendale Community Organization will meet tomorrow evening at 7 p.m. in the school at St. Thomas Aquinas Church. Everyone in the neighborhood is invited to attend. Please enter through the middle doors. For the past month, a special committee has been planning what the WCO should focus our efforts on this year. That committee will present its plan to the membership tomorrow evening for approval. You can expect much more news about this in the Warrendale (Detroit) Blog. For the fifth day in a row, the text messaging scandal that Mayor Kwame M. Kilpatrick finds himself embroiled in was on the front page of the daily newspapers. While the comments left on this blog have been unanimous in the opinion that Mayor Kilpatrick should resign, I don't think that is going to happen when he addresses the public tomorrow evening. I am personally disappointed that it has take Mayor Kilpatrick this long to address the public. It was a good idea for him to consult with an attorney before making any public statements, simply because he is accused of a felony and there are multiple on-going intestigations. However, I believe he has been in seclusion for too long. The on-going mortgage crisis has decimated the Warrendale neighborhood. The U.S. Conference of Mayors met this past weekend to finalize a strategy for dealing with it. Mayor Kilpatrick was originally scheduled to attend, but he instead spent this past weekend in seclusion. 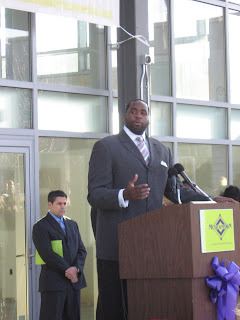 Mayor Kilpatrick had been a part of the process up until this moment. It's not clear how much, if at all, the needs of Detroiters suffered from his absense this past weekend. However, in general terms, it is simply not a good idea for Detroit's mayor to miss important meetings like this one. Detroit has needs that cannot be effectively dealt with in seclusion. For the fourth day in a row, the text messaging scandal that Mayor Kwame M. Kilpatrick finds himself in the middle of is on the front page of the newspapers. I've read several comments, both here and elsewhere, that the fact that Mayor Kilpatrick was re-elected after the scandals in his first term is a sign that Detroiters have very low standards; that we're doomed and that this is only a continuation of what has always been going on. Before I respond to that, I want to reiterate my standard disclaimer: my opinions are my own; they do not necessarily reflect on the Warrendale Community Organization or any other group of which I am an officer. Detroit has some problems and Mayor Kilpatrick is far from perfect. However, I worry that we as a community might lose our sense of perspective. With that in mind, I would like to recap a few things. First, in the summer of 2005, Mayor Kilpatrick became the first Detroit mayor to come in second place in the mayoral primary. He was almost eliminated at that early stage - something that rarely happens in American politics. Shortly after that, Rosa Parks passed away. Her funeral presented Mayor Kilpatrick with an opportunity to both remove the scandals from the public's attention for a few days and, more importantly, to appear as a quiet, committed leader in front of the news media. By most accounts, that funeral did a lot to help Mayor Kilpatrick's re-election campaign. There was also the fact that his opponent in the general election, Freman Hendrix, had a considerable amount of political baggage, which carried from his tenure on the Reform School Board. That baggage became downright devastating when the Kilpatrick campaign aired a television commercial with footage of Mr. Hendrix demanding that a grandmother be hauled away during a protest at that meeting. Finally, there is the fact that Mayor Kilpatrick got a considerable amount of support from the labor unions, which are still key political players in Detroit. After all of that, Mayor Kilpatrick was re-elected with only a 6% margin of victory. Looking forward, there is the fact that Mrs. Parks will not be having another funeral in 2009. Moreover, it is unlikely that Mayor Kilpatrick will face a challenger with as much political baggage as he did last time. There is also the fact that the labor unions do not seem likely to be supportive of his next campaign since they are already calling him a "lame duck". Whether or not Mayor Kilpatrick is re-elected next year will, in my opinion, depend entirely on how well the City is managed and on how successful he is in building the Next Detroit that he often talks about. There can be no doubt that he has accomplished some amazing things in downtown Detroit. The result in the neighborhoods, however, have been more of a mixed bag to put it mildly. The six neighborhoods that the Kilpatrick Administration targeted for the Next Detroit Initiative have shown some significant improvement. The other neighborhoods, however, remain in what can politely be called a challenging condition. There are 21 months remaining until his re-election. A lot can change in 21 months. The first President George Bush went from more than a 90% approval rating to being out of a job in roughly that much time. If Mayor Kilpatrick wishes to remain in office, he would do well to concentrate on the neighborhoods even more than he currently is doing. I haven't been posting as much as I would normally like to do. I spent most of this month organizing an event over at the Music Hall. For more details, you can see my personal blog. The next general meeting of the Warrendale Community Organization will be at St. Thomas Aquinas (5845 Auburn) on Wednesday, January 30th at 7:00 pm. Everyone is invited to attend. Please enter through the middle doors of their school building.